Since I started this blog a little over a year ago I read many more blogs on a daily basis. Each blog brings something unique to the table and I wanted to catch up with some of them on the Well Traveled Mile. Every Friday you’ll find a Q & A series that is focused on picking the brains of the best miles and points bloggers and travel hackers out there. Please feel free to ask them questions in the comments! This week we’ll be talking to Ariana who writes PointChaser, a miles and points blog that writes a lot about some of the best ways to choose what hotels to burn your Club Carlson and Hyatt hotel points. When and how did you start in the miles and points world? I started about three years ago after reading about the now-defunct US Mint coin scheme. I started researching the travel hacking game and took my first “free” trip within a year. Your blog has lots of great best uses for Club Carlson and Hyatt hotels. What’s the most important factor when choosing the best use on a hotel? When I redeem points for a hotel, I base it purely on value. I recently stayed at the Park Hyatt Sydney, which was going for over $1,000 per night. There was no question I was going to use 22,000 points for that stay. What’s your favorite Club Carlson property? What about Hyatt? For my Best Club Carlson Redemption series, I researched a lot of amazing properties, though I have yet to stay at one. 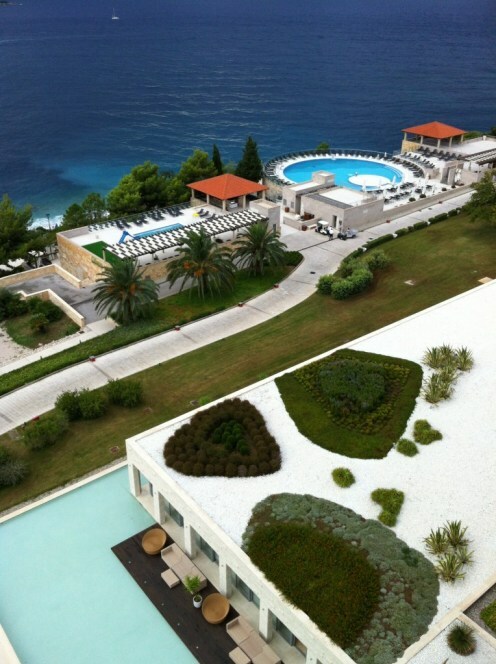 The Radisson Blu Dubrovnik looks great and I’d love to redeem some of my points there some day. As for Hyatt, I absolutely loved the Park Hyatt Sydney. What hotels are on your bucket list? I’d love to stay at the Intercontinental and Conrad Koh Samui. One of these days I’m going to follow through and book a stay at the Ritz Carlton Half Moon Bay. I’ve been there before and between the rugged coast and bagpipe playing in the background, it feels like you’re in Scotland. If you have points with multiple hotel programs, how do you go about choosing where to stay at a destination? It depends on which chain I have status with. I’ll stay wherever I can get free breakfast and WiFi. Club Carlson’s just devalued their program, what’s your take on it? It actually wasn’t entirely bad. Only 9 properties are moving to the new category and award nights will now count towards elite status. Considering most people earn their Club Carlson points from credit card spending rather than stays, this is a positive change. Over the last year we’ve seen a lot of hotel devaluations, what are the most valuable hotel points to currently earn? Starwood is a good currency to focus on. Maybe it’s because they’re not handing out points via half a dozen credit cards, but they have yet to announce a drastic devaluation. They have a vast portfolio of hotels around the world, their redemption levels are generally reasonable, and you can get great value out of the Flights + Nights option. Ariana, thanks for letting me pick your brain over some of the best ways to get the most out of your hotel points and thanks for a great second Q & A Friday. If you have any questions for Ariana, ask them below in the comments! Is there a topic or blogger you’d like to see on this Q & A? Leave your suggestions in the comments!